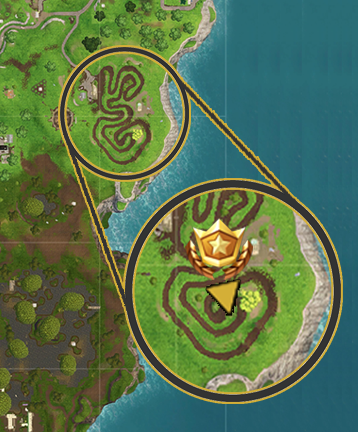 As part of the Fortnite Week 3 Challenges, you’re tasked to follow a treasure map found in Salty Springs. You’ve got until Thursday to complete challenges from Season 4. Fornite Season 5 starts this week – so finish up quick. Another week, another treasure hunt. This time you’re looking to follow a map found in Salty Springs. Follow it to a giant Battle Star and you’ll get 10 stars and shoot up a tier. Nice. You can of course go to Salty Springs and find the map pinned to a wall, decipher the scrawled clues and track down the location. But that’s the long-winded way. Instead, we recommend following this handy map, which shows the Battle Star is on the east side of the map, to the left of the biggest tree at the race track. The location is J7 on the map grid. All you have to do is drop out the Battle Bus and glide down to its location to grab it. Salute to Gaming Soldiers for the map. And that’s it! You can now get on with the rest of the challenges, such as finding 10 Rubber Duckies on the map. Or you could camp that spot and wait for other players to land and fill them full of bullets while they swing their axes wildly. Complete all seven of the weekly challenges and you can claim another free giant Battle Star for the Blockbuster Looming Threat Challenge.